She called the federal NDP leader's stance "irrelevant" last year. Alberta Premier Rachel Notley and federal NDP Leader Jagmeet Singh are shown in a composite. Alberta's New Democratic Party premier pulled no punches Wednesday when asked to respond to the federal NDP leader's contention that the Trans Mountain pipeline project shouldn't go ahead. At a press conference in Edmonton, a reporter read a tweet from Jagmeet Singh in which he said it is "clear" the Alberta-British Columbia pipeline shouldn't be built after it was approved through a "rigged" process. "I think Jagmeet Singh is absolutely, fundamentally, incontrovertibly incorrect in every element of that tweet," Notley said with a smile. Asked how difficult Singh might be making her life these days, Notley shrugged. "Actually it's not really a big part of my day-to-day considerations on the work that we need to do to get this pipeline built and to get construction resumed on schedule in June," she said. Last November, Notley pointedly called Singh's view of the project "irrelevant" because the Trudeau government had already made its decision. On Wednesday, Notley was responding to an announcement from Finance Minister Bill Morneau that Ottawa will financially back other investors if Kinder Morgan decide walks away from the project this month over delays from the the British Columbia NDP government of John Horgan. The Alberta legislature passed a bill that will allow the province to cut the flow of oil to B.C. in retaliation. 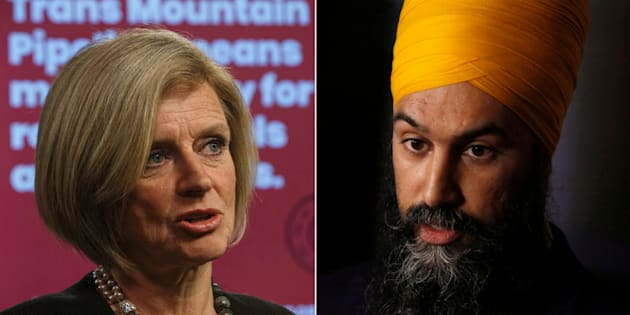 The public scrap between two different provincial NDP governments has perhaps made things uncomfortable for Singh, but the federal leader has frequently said both Horgan and Notley are doing what they think is best for their provinces. That was the same message Singh delivered at his own news conference in Toronto following Morneau's announcement. "I respect what Premier Notley is doing. She's representing the interests of Alberta and Alberta alone," Singh said about being at odds with a provincial counterpart. "My analysis is at a national level." The federal NDP leader said he is looking at environmental concerns and issues flagged by B.C. First Nations communities. "Nationally, we've got a government that's trying to put taxpayer dollars, public dollars at risk, for private profits in a circumstance where there is no business case," Singh said. Singh referenced reports he said suggested the Liberal government had already made a decision on the project before consulting with First Nations. Last month, the National Observer reported that government insiders were directed by a top public servant in 2016 to give the Liberal cabinet a "legally-sound" basis to approve Trans Mountain. Liberals, however, deny anything about the project has been "rigged." They've maintained that the $7.4-billion plan to double an existing pipeline between Edmonton and Burnaby, B.C. is in the national interest.